Continue struggling against the discrimination in education! Hate speech is not freedom of expression! Kaos GL Legal Advisor, Attorney Hayriye Kara indicated in her speech in Northern Cyprus that struggle of LGBTIs affects the courts. 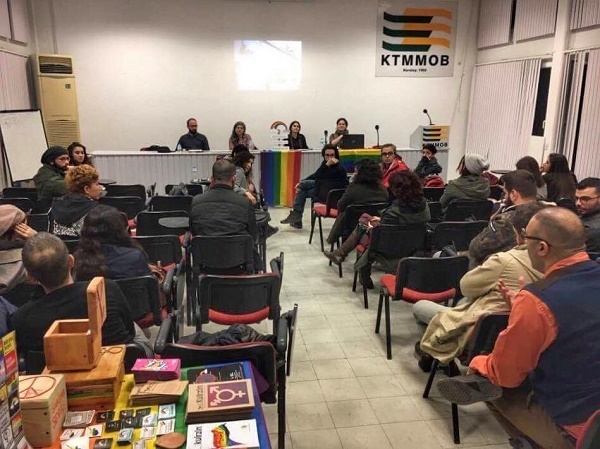 Queer Cyprus Association’s social media activity “#27Ocakda #nedeğişdi” (#Whatschanged #inJanuary27) ended with the “Nefret da Değişir” (Hatred can also change) panel on Friday, January 27. During the panel, Kaos GL Legal Advisor Hayriye Kara talked about hate spech targeting LGBTIs in mainstream and social media, and the legal struggle against this discourse. Hayriye Kara started her speech by telling that Kaos GL was the first LGBTI association founded in Turkey in 2005 and that Kaos GL is working on different fields like law, media, academia and refugee rights. Then she told that unlike Cyprus there is no law favoring LGBTIs in Turkey, but that there is also no law directly criminalizing LGBTIs except military law. After describing the hate crime, Kara told how the crime is enacted in international law, how the European Court of Human Rights assessed the hate crime, and why it is necessary to arrange a separate regulation on hate crimes. Lawyer Kara stated that the perpetrator must act with prejudice to be able to form hate crime and that this crime must be defined in the criminal law. Reminding that the hate crime was not committed against only one person, that the crime is a threat to the group which the victim belongs to, and Kara added that prejudicial crimes are in a different place from criminal offenses, therefore a separate arrangement is necessary. Kara stated that another problem is that lesbian, gay, bisexual, trans and intersex people do not believe in justice anymore, and she added that LGBTIs suffering from a criminal offense cannot access their legal rights with the fear of being exposed to discrimination or of disclosure. "The existence of laws protecting gender equality is not enough, and law enforcement officers need to learn to decide according to their professional ethics, not on their education and their prejudices," Kara said. “Saying that we are a conservative party, so we cannot do anything for LGBTIs increases the divergence in the society” said Kara, and she emphasized that legal regulations as well as language of the government must change. While mentioning reflections of hate crimes in media, Kara also stated that the statement of the government saying “homosexuality is a disease” causes that LGBTIs would be discriminated more and suffer from hate crimes. Reminding the European Court of Human Rights's decision on Vejdeland, Kara sstated that hate speech through media in Turkey and in Cyprus could not be freedom of expression by saying "even if they do not call for hatred directly, discourses legitimizing and sharpening discrimination cannot be considered as freedom of expression"
What has changed in Turkey? Considering the differences between the court decisions of the 1990s and the decisions of today in Turkey as important developments, Kara added that this change is thanks to the struggle of the LGBTIs and the struggle affected the courtrooms.